This is a special preview to my upcoming novel, Final Hope. I’ve been working on this story in one form or another since 2008. At long last, it is nearly complete. For those of you who have been waiting, I’m very excited to present a sneak peek at the first chapter. I hope you enjoy it! Please feel free to link to this content, but do not publish or post elsewhere without explicit permission. It was a strange juxtaposition to his outlook before the mission began. The Chlorophyllium Project was exactly where he’d dreamed he would find a home, a purpose. But nothing since joining the mission had turned out the way he’d expected. The control room within the rift bay had once been his sanctuary. It was the one place where he could lose himself in his work for hours at a time. Back then he was doing the right thing. They were saving the world. With the rift drive running deep cycles behind him, the charged air almost crackled in anticipation. He was keenly aware of each passing second. Each heartbeat was one thud closer to the end. The bay felt like a coffin. Every time he looked out at the platform, he stared death in the face. Greg’s time aboard Final Hope had changed him. He was hopeful once, enchanted with the prospect of saving the world. The future held endless possibilities. Of the nine vessels, Final Hope hadn’t been his first choice. Now he thought back on how hard he’d scrambled to switch his assignment and wondered what things would look like if he had stayed true to the other path. He had his reasons for getting his orders changed. For one, he thought it would be better. He thought he was doing the right thing. Now he knew just how much his choice had cost. The months on board had broken and hardened him. 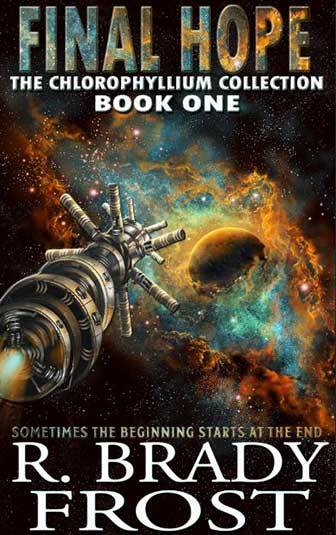 Everything he thought he knew before they embarked from the space station was wrong. Greg closed his eyes and tried to wrest his thoughts from the past. He had to focus. Could he really hope to change the inevitable? He had asked himself that very same question before signing up for the mission. Back then he wondered if their actions would be enough to save the world, now the question meant something else entirely. Despite how he felt right now, he’d managed to achieve incredible things. He knew this. He got to see the marvels of space with his own eyes. He’d opened portals to a strange, new world. He’d retrieved huge quantities of chlorophyllium ore. More than anyone else in the fleet, in fact. But it wasn’t enough. Things had been set in motion, things he couldn’t just walk away from. These darker happenings and the deep sense of loss he felt over the way things had turned out overshadowed any possible sense of achievement. He hoped the people back home would understand. He tried to reason with himself that he’d been a force for good. Then he thought of the distant world they’d spent months mining into oblivion. By all accounts, it was just an empty rock on the other side of the universe. Those were fine words, but he wasn’t so sure they were the best fit. One thing he did know for certain, however; was that everything had a price. Now it was time to pay up. The terminal beeped, prompting his attention back to the impossible decision in front of him. Months of agony condensed into a single moment as Greg held his hand above the inductive surface. He thought of the future. He thought of the past. Then he thought about the consequences of doing nothing at all. He pressed down on the console and waited for the DNA scan to confirm his identity. Once the computer accepted his biometric credentials, strings of commands began cascading down the terminal interface. There was nothing left to do but wait, and his mind wandered in the absence of activity. Greg had never stopped dreaming about space. Visions of the Last Great Frontier had been with him since he was a child in the smog-choked underworld of Earth’s lower sectors. He watched in rapture as crews mined the first captured asteroids, resulting in the generational surplus of once rare materials harvested by corporations looking to expand their empires. Metals like platinum and rhodium were now common, but those early efforts hadn’t been sustainable, or nearly enough. The golden age of space exploration had come and gone while the dreamers lost themselves to other dreams. None of humanity’s efforts helped prolong life on Earth. They only seemed to fuel the exodus. It was easy to blame the colonies. When Earth began to die, the world’s elite hand-picked the crews for their vessels in secret. Instead of exploration, the new focus had been to escape. Those fortunate enough to find a place aboard a colony ship abandoned Earth and the solar system that birthed it. They set out for greener worlds, ones yet untouched and still fresh with plentiful resources. The few had deserted the billions. In their darkest hour, the Chlorophyllium Project gave those who remained one final chance. They couldn’t leave Earth like the colonies had, but with chlorophyllium came hope and new possibilities. Renewal. Regrowth. Revival. Greg was supposed to be saving them. This was never what he wanted. Who was this man he had somehow become? He felt like a stranger in his own skin. It wasn’t just him or the mission itself that had changed. He looked at the floor and the walls of the control room and surveyed the chaos that surrounded him. Final Hope was no longer the ship he’d set out on, that much was clear. Everything in the rift bay and the attached control room had been rebuilt. Entire sections of the science deck had been pieced back together since two colliding rifts had torn her apart from the inside. Greg witnessed the collision firsthand. It was the most terrifying thing he’d ever seen. None of the theory-based simulations could have prepared him for what had happened that day. He watched, helpless as the colliding rifts ripped through carbon fiber, titanium, and reinforced steel like it was nothing, leaving unfathomable loss and destruction in their wake. There was nothing he wouldn’t do for the chance to go back and stop the collision from happening. That had been the defining moment. The point of no return. Ground zero. Doomsday. That was the day he lost everything. But, of all the improbable things he’d seen and done, going back was one thing he still couldn’t do. Time travel. It didn’t work that way, and he knew it. Even so, he wondered if his impossible wish wasn’t the one thing keeping him sane. Just over three months had passed since that horrible day. The reinforced beams and panels, once pristine, now had a hodgepodge look to them. Parts were begged for, borrowed, and, in some cases, stolen. The military did what it always did in situations like this: whatever it took to get the mission back on track. The crew worked night and day to repair the structural damage while he restored the rift drive to workable condition. It no longer had many of the bells and whistles that simplified the process of creating rifts, but the mission went on. Chlorophyllium poured in faster than ever before, and the remaining vessels in the fleet struggled to keep up. For three months Greg had worked without rest. He worked in spite of himself and his desire to give up, to let go. He worked because the collision haunted him. The plasma burns on his shoulder wouldn’t allow him to forget. He worked through the pain and the agonizing memories. He worked to avoid sleep and his tortured dreams. He worked against time. Nothing felt the same. His work was all he had left. Some things could never be replaced. Some pain could never be forgotten. Final Hope was tainted by the misdeeds of the very men entrusted with command. He had no choice but to try to right those wrongs. Still, Greg’s decision hadn’t come easy. He watched the progress bar on the terminal interface. It was creeping along slower than snail snot. Snail snot… He couldn’t help but visualized the smelly, greasy substance they used to run the relays to the rift drive through the new control interface. The thought of it made him cringe. Of course, snail snot wasn’t the official name of the cable lubricant. It was a term which had little to do with actual snails, which had caught Greg off guard at first. As a rift engineer, he had taken the moniker literally, a fact that one technician, Ronnie Gibson, had found hilarious. Still, the name seemed to fit the thick, mucous-like goo that refused to budge from any surface it came into contact with. The thought of it reminded him of stringing the cables and finally reconnecting the new control interface. That moment felt like a lifetime ago. He reached down and touched the side of the terminal where a plasma burn remained etched into a panel that was serviceable enough to avoid replacement. It had survived the very brink of disaster. Greg considered that for a moment and felt a deep kinship with the deformed metal. He remembered the arc that had lanced into it, leaving the scar. It wasn’t too different from his own. His fingers felt their way over his uniform to the puckered skin on his shoulder before he pulled his thoughts away from what had happened next. The collision hadn’t been Greg’s fault. Not directly. But his inability to stop it from happening was just as bad. It had taken all he had to get them to this point. Pulling the two rifts apart, then piecing together the ruined pieces of the mangled rift drive. It had been a long, hard road but, as if guided by fate, everything had fallen into place. There was but one path, and only one purpose that made sense. Sometimes he questioned whether he had a choice at all. If he didn’t do this, would some mysterious force somehow usher them toward the same outcome of its own accord? What was it that kept propelling them forward? Was it time? Fate, perhaps? Or Destiny? It made no difference what you called it, the result would be the same. There was nothing he could do to stop it now. The only logical choice was to embrace it, to dive headlong into the calamity with both eyes wide open. The end was near, and no matter what happened, or how things turned out, one thing was certain: this time it would be his hand that pulled the trigger. Greg looked down at his gauntlet and pulled up the scripts he’d spent countless hours coding. I hope you enjoyed this sneak peek at my upcoming novel, Final Hope! If you did, I'd love to hear you in the comments below. Sign up for the Newsletter today and receive exciting author updates and release date notifications delivered right to your inbox.